Rod Correia picked up three hits off future Hall of Famer Randy Johnson on this day in 1993 and Johnson seemingly decided to make Correia pay, according to The Los Angeles Times. The result was Correia got a fastball to his leg and ultimately had to come out of the game. "If that ball had come four inches lower, it would have caused some serious damage to my knee," Correia told The Times afterward. "But I'll remember this, and you're damn right I'll get even." Correia's team got even by coming back and knocking around the Mariners the next day - and throwing behind some batters. Correia never faced Johnson again after that game, but he did come back and play in two more major league seasons, trying to take advantage of the opportunities as they came. In all, he played professionally for 10 seasons, getting into a total of 84 big league contests. Correia's career began in 1988, taken by the Athletics in the 15th round of the draft, out of Southeastern Massachusetts University. Correia is also credited by his full name, Ronald Correia. Correia played his first year at short-season Southern Oregon. He then moved to single-A Modesto for 1989 and 1990. He made AA Huntsville in 1991, as well as AAA Tacoma. Correia then moved to the Angels in a trade. 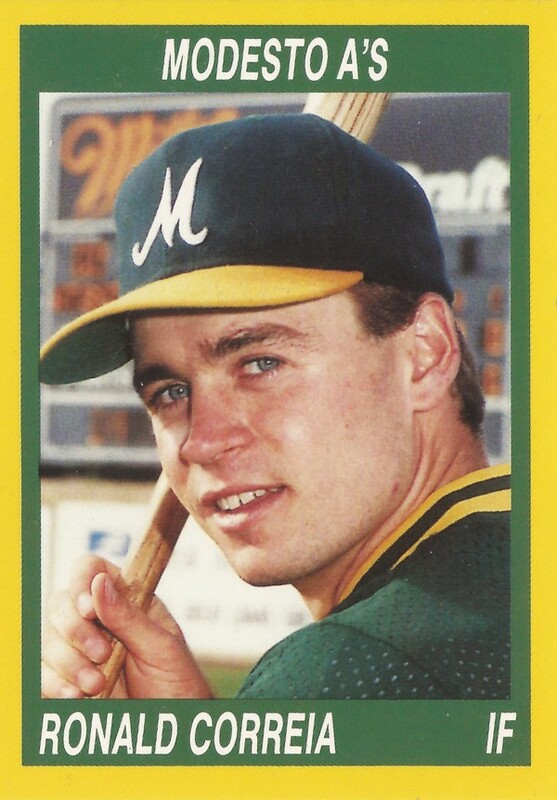 He played 1992 at AA Midland, hitting .290. He moved back to AAA with Vancouver in 1993. That year, Correia also made his debut in the majors. Correia got his call up that June. He made it into 64 games for the Angels, hitting .266 while knocking in nine. He returned to the Angels for another six games in 1994, then 14 final games in 1995. In a July 1995 game, Correia filled in for Gary DiSarcina by knocking a two-run triple and later a single. His work helped the Angels continue a hot streak, according to The Times. "You see everyone running around the bases all the time and you want to jump in," Correia told The Times. "You don't want to be caught on the side." That September, Correia and the Angels took on the Orioles, Correia getting into the game where Cal Ripken set the consecutive games played record. "That night alone was worth my 10 years in professional ball," Correia told South Coast Today in 1997. Correia played two more seasons, both in the minors. His final season came in 1997, between AA Trenton and AAA Pawtucket for the Red Sox. Correia now works in the financial services industry, serving as president of Rhode Island-based Shamrock Financial Corporation.